Bastor wrote: Yeah...she's going to build a GIANT sand wall in order to protect the tiny castle....? THEIR tiny castle. Maybe it's representative of a relationship. The measures you put into place in order to stop it getting washed away by the metaphorical tide are usually more substantial than the relationship itself ever was. Jesus I am cynical. I pity my boyfriend. Is there any way to go back? And if not, do you think it'll loop? And if not, then will this be like an ice sculpture or something where you can only appreciate it once? * Cause if so, that's a pretty ballsy idea. *Apart from the archives in here. Which are kind of cheating, but at least they're cheating in an interesting way. On the subject of the alt text, I haven't seen it mentioned yet that often times when people post (e.g. on imgur) animated gifs which are apparently still or at least boring at the start but have something cool worth watching them through for, they will be titled/captioned/tagged/commented "wait for it" to encourage people to, well, do that. This is basically the slowest-playing animated gif (not really a gif but whatever) ever, so, alt text is appropriate: it looks perfectly still at the start, and once you even realize it's animated it looks kind of boring, but presumably it's building up to something worth waiting for. Anyone noticed that we have a two tower building here? And 11 and 9 (and ZERO!) in the title number? Last edited by super_aardvark on Tue Mar 26, 2013 10:04 am UTC, edited 2 times in total. Homer: Will this episode be going to air live? June Bellamy: No, Homer, very few cartoons go to air live. It's a tremendous strain on the animator's wrist. I'm out now for the night/morning. Keep posting them in here please! May I suggest "MMPONS": Massive MultiPlayer Online Nerd Sniping ? SWuh wrote: THEIR tiny castle. Maybe it's representative of a relationship. The measures you put into place in order to stop it getting washed away by the metaphorical tide are usually more substantial than the relationship itself ever was. Relationships and analogies are far too complicated. Sand castles are simple and fun. If it turns out to be a dinosaur can we just agree that it's an homage to both Schulz and Watterson? For the last 27 hours? Anyone else noticing posts in this thread moving down the page, or onto the next page? Did xkcd just crash/go offline? the main site seems to have broken. hopefully we will get our next slide soon! Last edited by KroniK907 on Tue Mar 26, 2013 10:06 am UTC, edited 1 time in total. K-R wrote: Anyone else noticing posts in this thread moving down the page, or onto the next page? I reckon some posts that were awaiting moderation just got approved. So, perhaps Randall is up & active, which would lend weight to the idea that he might be doing this live. Bastor wrote: Relationships and analogies are far too complicated. The only problem with this one is that it gives you far too much time to think about metaphors and analogies. If this comic were over already, then it would just be a "YAY pretty castle" moment for me. And why not? Aren't we? Yeah, I didn't mean the Randall part to be a serious suggestion. I didn't know specifically, but figured on delegation. Someone mentioned perhaps he saw something out on the water, and is waiting for it to return. I've never played MineCraft, but I understand people build castles in it to protect against creepers or something. Is it possible there's a MineCraft baddy coming at them from the ocean, and that's why they're building the sand castle? Otherwise, I like the idea that the tide will destroy the castle and then it will loop, with another couple building a new sand castle. Better watch out for the time vultures, then. I wonder if they might put in an appearance? mybrainhurts wrote: I knew it! OMDFG! I don't know whether to hope you are right or wrong, but you sure made me laugh! ...But where does it go from here? and why does the "giant" look like Hitchcock? It is now 6 hours into Tuesday (Eastern). I have yet to see a what-if for today. Does anyone think that this has anything to do with the ongoing comic? Just a side note: Is this the largest comic thread this forum has seen? I went and looked to see how big Click And Drag was, but the comment number for that has already been outdone. Am I the only one who thinks she is burying herself? Bastor wrote: Am I the only one who thinks she is burying herself? 1) Story won't end with the "End Of The World." It's too predictable and wouldn't be too interesting. 2) Something WILL happen. Alt-text asks us to wait. In this case, not finishing the story would be trolling. 3) Something tragic will not happen. Because of the timing. It would work few hours ago, when everyone were still excited, but not now. 4) Something random will not happen UNLESS the strip will actually stretch to 1.IV. There would be no point for a raptor to smash the castle and scare away the pair before this date. Anyway, I personally wouldn't like a 1.IV ending and I don't think it will end like that. I have few more though, just to ruin some theories. 5) Water is unrelated. He was just checking the temperature to see if it's ok to go swimming. He decided not to. 6) The story will not be personal. I mean, come on, you can see the development so far - it's just an innocent sand-castle building story so far. Making a twist and making it personal wouldn't do anything good at this point. So I think "building up to something great" still stands. The girl is building something huge and when the boy comes back, he'll be very impressed by what she's done and surely will help her finish some details. I think it will be another sand castle - ten times bigger than the previous one. Or, I don't know, a sand-raptor. Password Strength is longer by about 50 at the moment. Regarding 5), I assumed this was just to set the scene, make it clear that there was water there and they were on a beach. There is an old saying "Rome wasn't built in a day" they appear to be making a large sand castle which could be a metaphor for his fan base which has built up over time. Or his wife recently started a sociology degree and he is using us all as test subjects. I really hope this one is the right one. Except generally arts degrees around here are frowned on. I probably payed a little to much attention in high school English. Either way cheers Randall for a flat phone and for making me not productive at work at all today. Of course, this being xkcd, he might simply have departed uphill to construct the launch ramp for whatever unlikely vehicle will imminently jump the castle and land on the ramp she is now constructing. A.length = 0, M = ""
I definitely agree with Beato's comments and theories. Although I suspect that when the boy returns he may not particularly like what the girl's done and yearn for the simplicity of their first castle again. Still, I think they'll get over it and have a happy ending regardless. It'd be too tragic otherwise, and that still wouldn't fit. I'm predicting the comic might last a whole week, and his April Fool's joke is that it doesn't turn incredibly silly at the end. 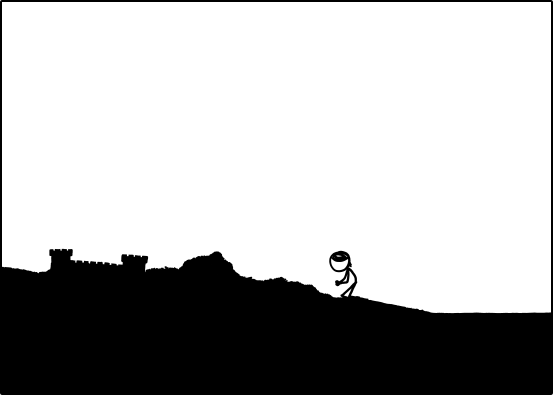 NotThatHatGuy wrote: Of course, this being xkcd, he might simply have departed uphill to construct the launch ramp for whatever unlikely vehicle will imminently jump the castle and land on the ramp she is now constructing. Good call... but he wouldn't say "bye" in this case. Angelastic wrote: Regarding 5), I assumed this was just to set the scene, make it clear that there was water there and they were on a beach. Yes. Good thinking. That strengthens the point 5. However, it could also be Cherkov's gun - the water was shown as innocent at the very start of the story, just to erupt into a wave at the end (or slowly increase its height as a tide). I thought about it for a while, but... both theories won't stand. That's because this is the beach. You don't see waves flooding the beaches unless it's a cataclysm (which it is not, as it would be the kind of "end of the world" ending when the scene is smashed to bits at the very end. Contradicts point 1). The tide, however, was a valid option... but think this through - how would it be presented? Water slowly rising with each panel, then going back. Considering the time flow (ha, ha!) within the story, it would take 8-12 hours to present such outcome, and we would know what it is after 4 strips. We would be bored by the next few hours. This strip isn't designed to present such story. Although I have one alternative that is worth taking into account. That is - the tide is coming an both characters try to defend against it. It would be a great twist, especially now with the bigger castle being build. The story could show how the tide ruins the huge castle/raptor/thing while the small one prevails only because it's build higher. I can picture it being like that. It would break the 5-th point though, and my hunch is telling me, the 5-th point is correct. Last edited by dalcde on Tue Mar 26, 2013 11:00 am UTC, edited 2 times in total.